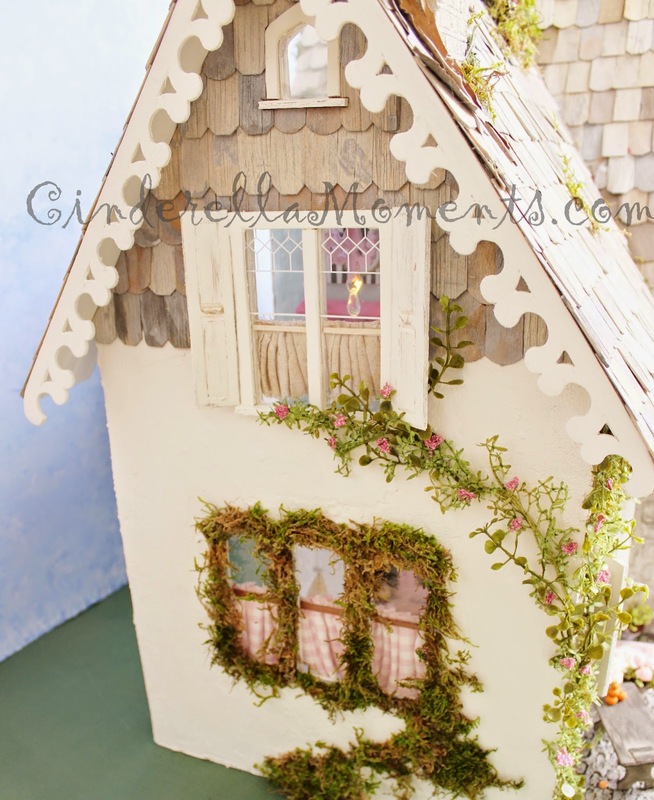 Wiltshire Cottage is my newly completed dollhouse. This one is totally English in style. The front porch area is really typical of those stone cottages you see in Europe. The house is battery operated. 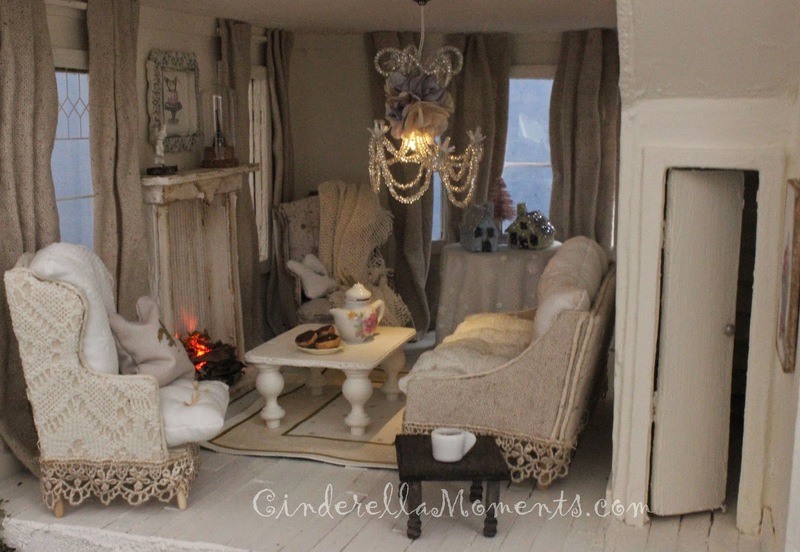 It has a front porch light, a living room chandelier and working fireplace, a kitchen chandelier and pantry light, a bedroom chandelier, a bathroom chandelier, a studio chandelier and 2 attic lights. There's a mix of stones and bricks on the facade. All in very muted tones. All made with premix concrete. This house is bigger then my usual little cottages. It's 25 3/4"(65.4cm) across x 25 1/2"(64.7cm) tall x 17 1/2"(44.5cm) deep. 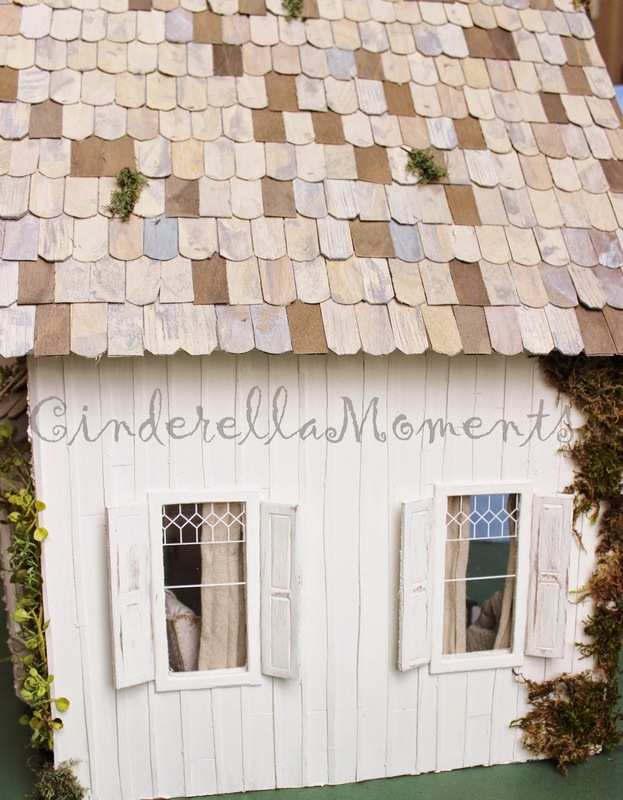 The left side is stucco and shingles. And the right side has vertical siding. Inside, I have not glued anything down. I used Simply Tacky to keep everything in place. 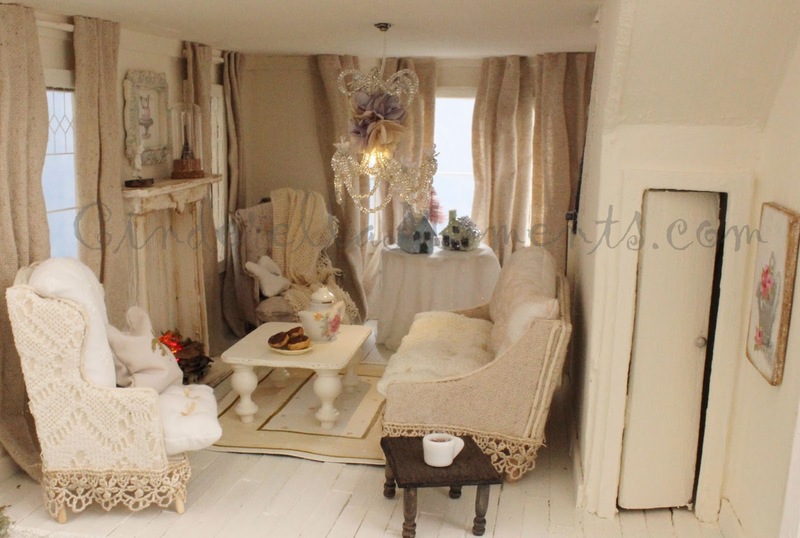 In the living room, I made 2 upholstered chairs, a sofa, 3 little tables, a chandelier, artwork, rug, glitter houses. There's a roaring fire too. The curtains are stiffened with hairspray. 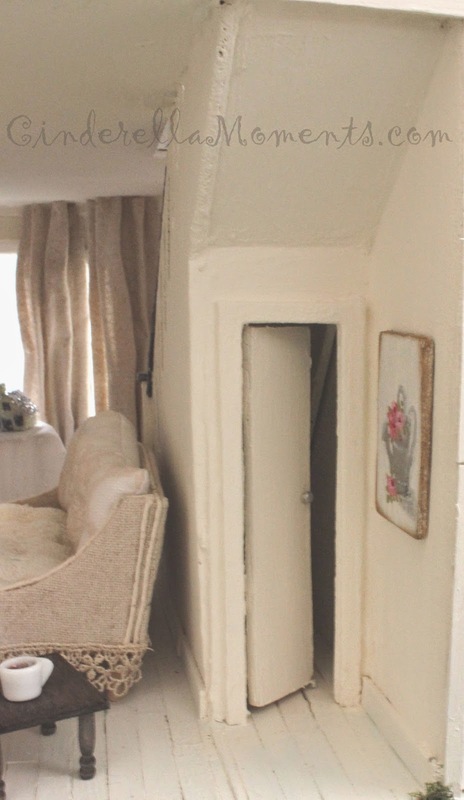 The little closet under the stairs has a working door. The kitchen is all decked out with cabinets, range, table, chair(the only piece purchased in this kitchen), shelves, food, utensils and a fully stocked pantry. Everything in the pantry is glued down. There's also a working light in the pantry so you can see the food. Right up the stairs is the bedroom. I painted a blue dress, made a white bench chair. I made a double bed since the space was so big. 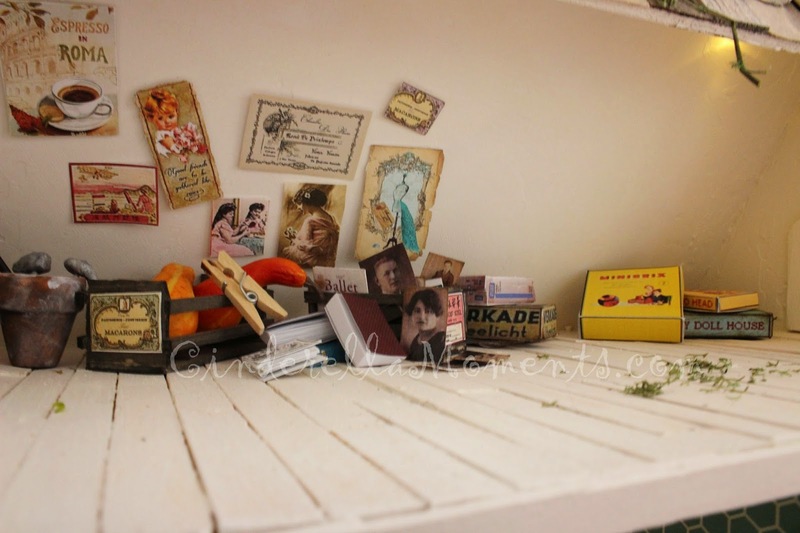 There's a primitive style bench made from scraps of wood, a hand painted rug and a little hat box. On the other side, I built a little desk from a kit by The House of Miniatures. Next to the bedroom is the bathroom. I bought a tub, sink and toilet. I painted the toilet seat pink. I added a bathmat and sink rug. 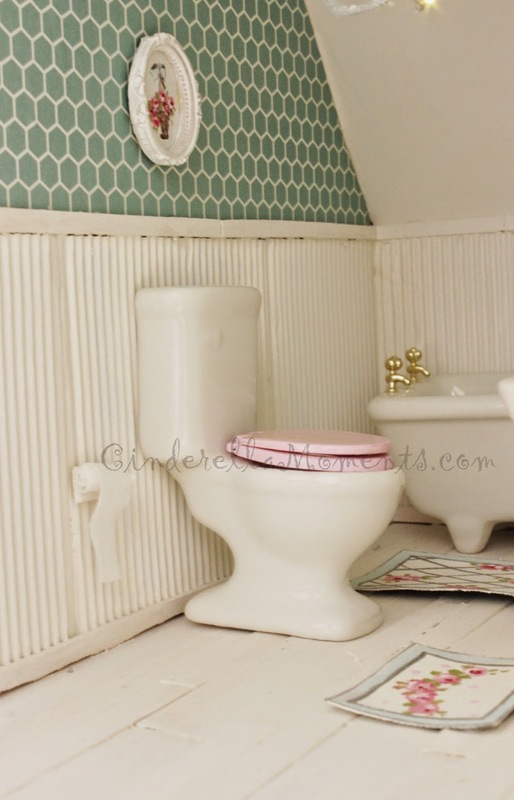 No bathroom would be complete without toilet paper! I squeezed in a little studio to get all those art projects done. Thank you so much for coming over and visiting Wiltshire Cottage! It's been a pleasure having you. 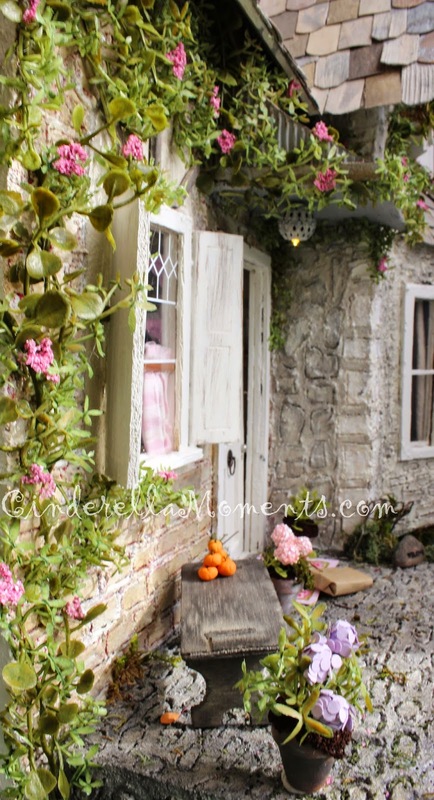 Wiltshire Cottage is available for purchase in my Etsy shop. Your houses are so amazing. I wish I knew how you make everything. You are my inspiration. The cottage is just adoreable. I love the outside with all the different textures used . The furniture is so beautiful. Your talent amazes me. What a beautiful cottage!!! On the outside at first site I thought is it real or mini... my compliments! Lovely inside with nice made furniture! Another lovely cottage Caroline. It has a lovely homely lived in atmosphere and as usual it is all the little details inside and out and you have added that make it special. 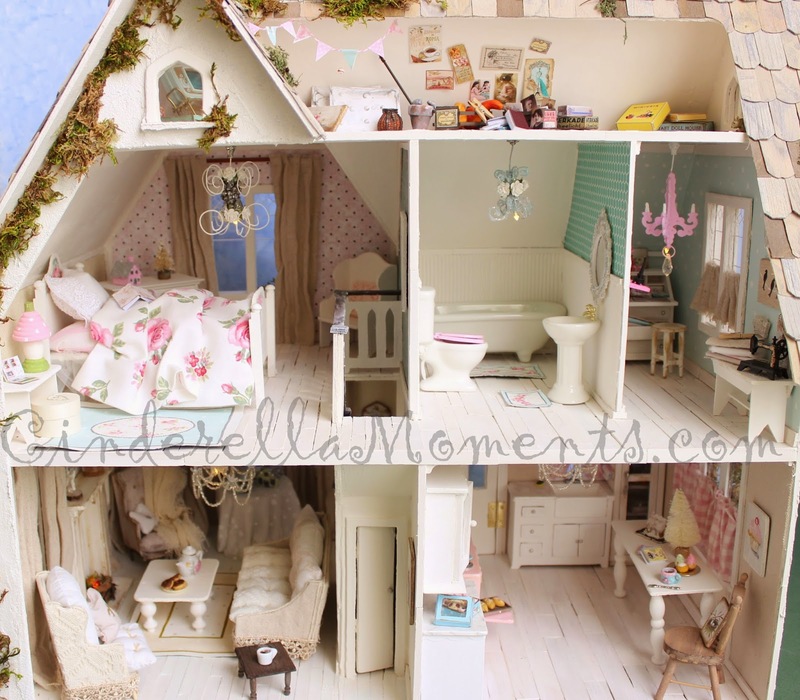 Absolutely delightful, packed full of charming details. 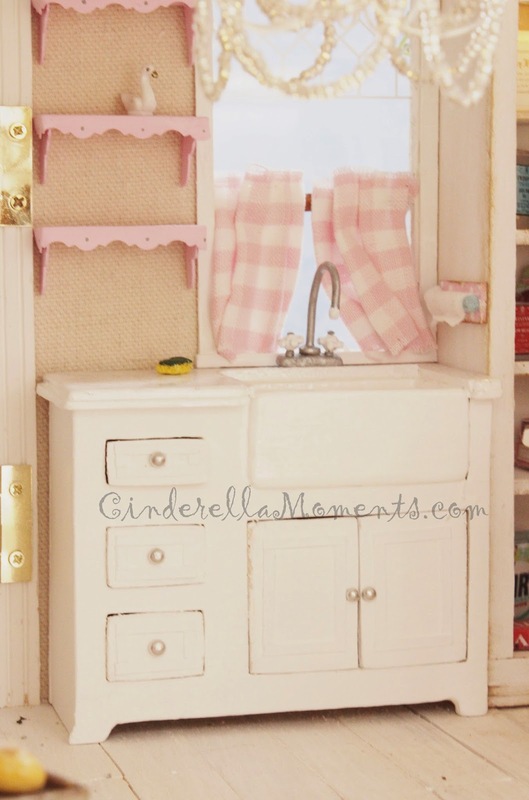 Love the tiny pantry! 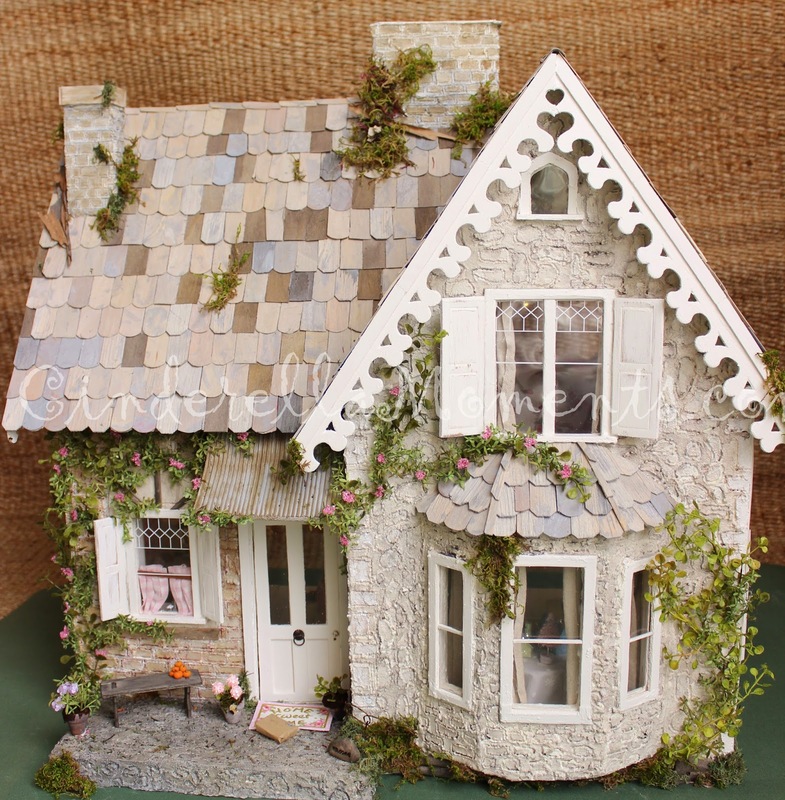 Absolutely wonderful work, it's such an adorable cottage, Caroline. 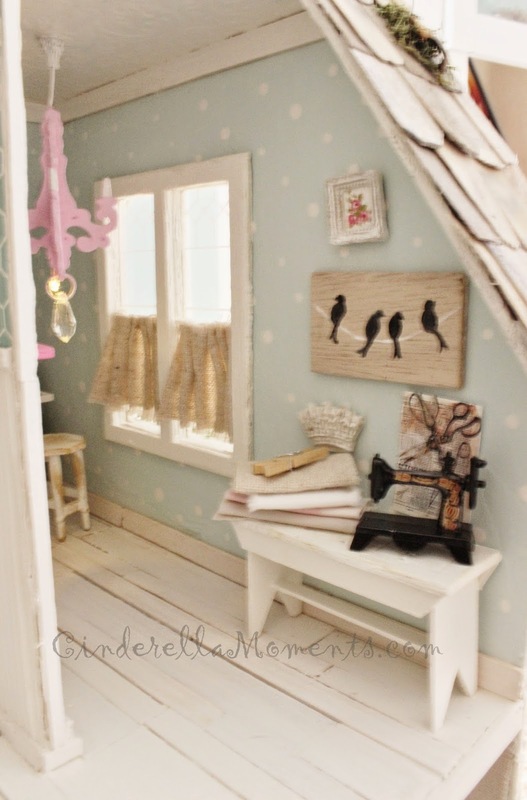 The interior has so much warmth and coziness, I also love the mouse you've added on the attic with plenty of "old junk" ;o! The duvet with the roses is gorgeous. wow! I love Caroline! few so sweet, details make a very pleasant stay. everything seems so wonderful ....! Congratulations for your hard work and patience. He is adorable, love it! You have been busy! 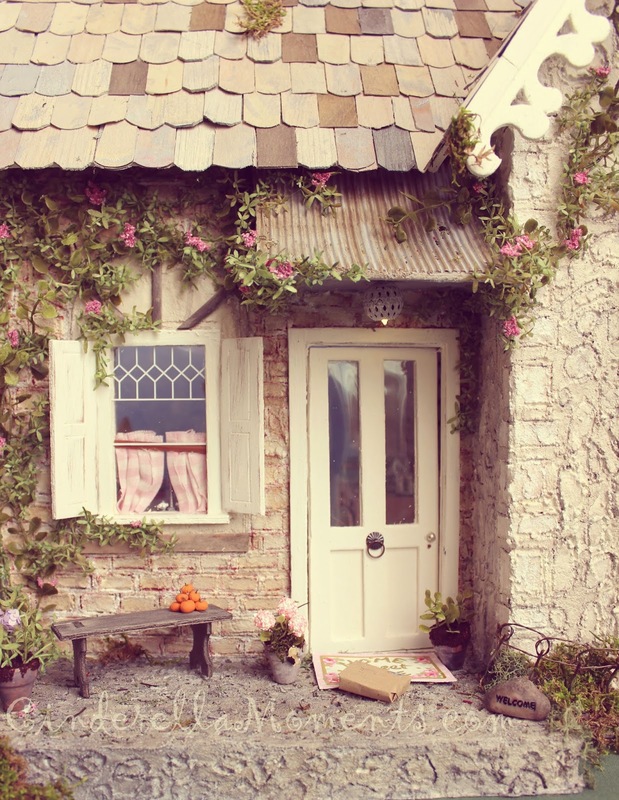 I love the outside of this cottage - it is so rural and cute. The roof over the porch is a particularly nice touch. 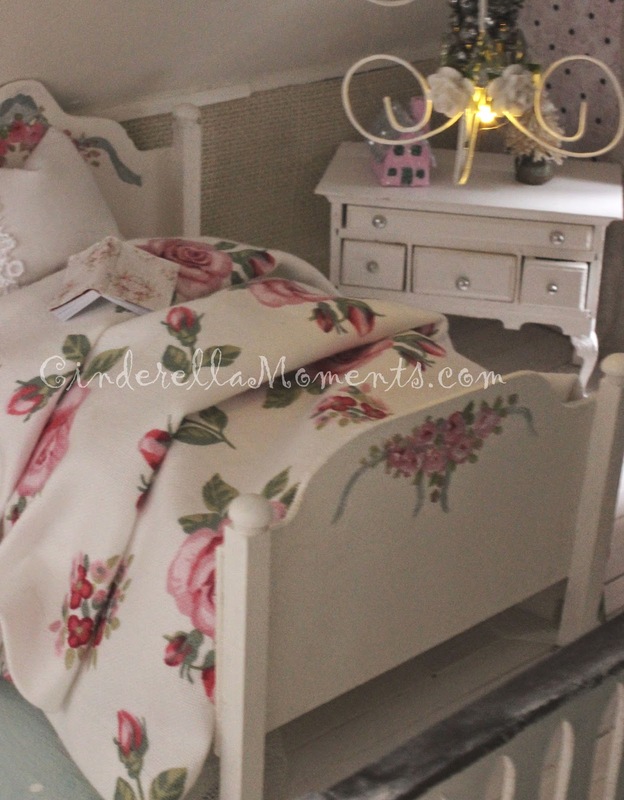 I also love the roses painted on the bed. Very pretty altogether. So so pretty! 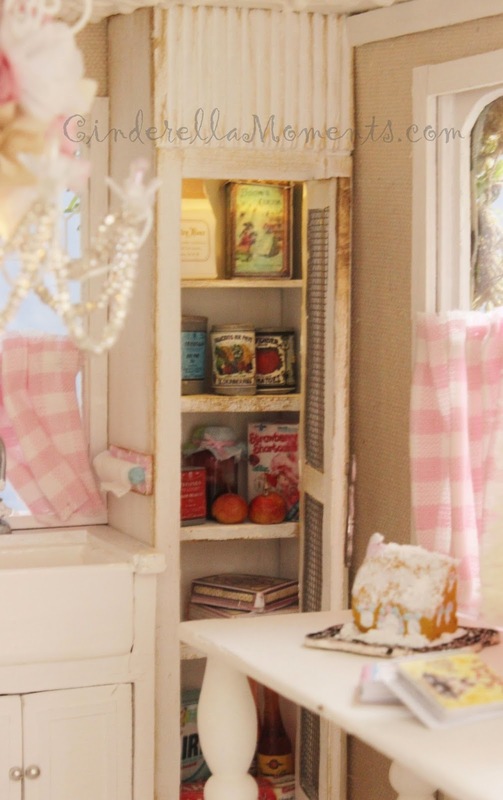 I love the little closet, it's details like that that make a dolls house all the more special. 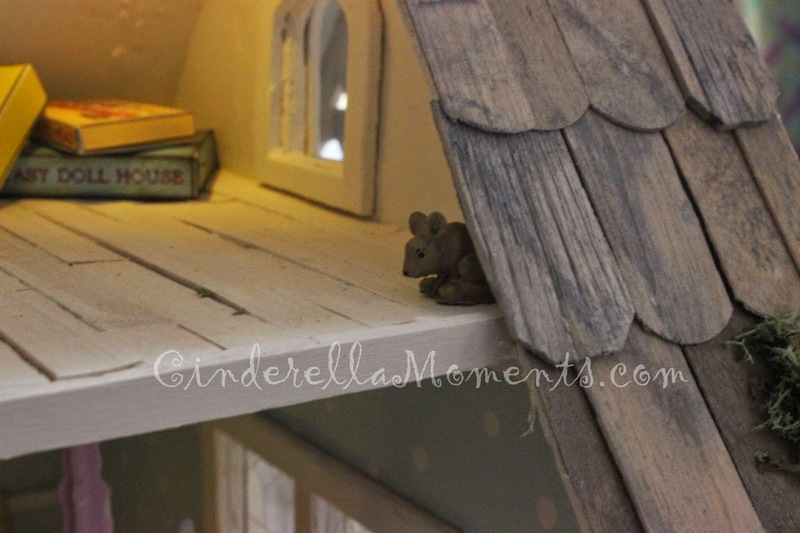 And the little mouse too :D Its altogether gorgeous. 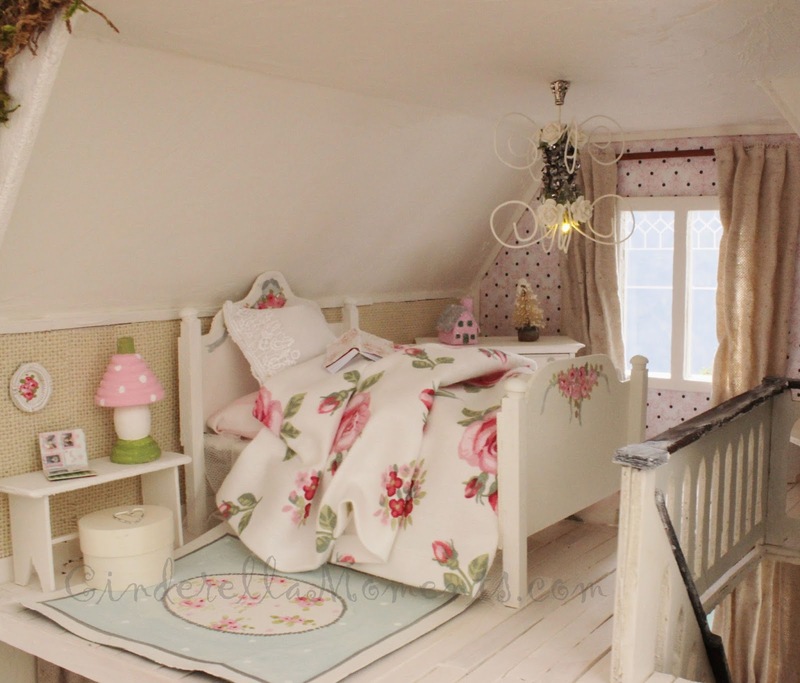 Oohh Caroline, what a romantic, cozy and charming cottage. 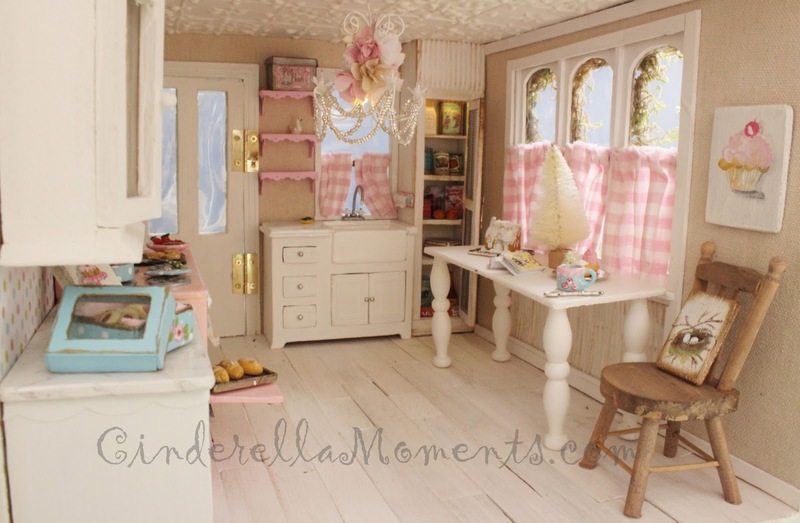 The pantry looks soo inviting and I love the little mouse on the attic, so cute ! I really enjoyed reading and looking your gorgeous Wiltshire Cottage. Beautiful cottage. I like the furniture and accessoires. What an adorable house! Your work is simply amazing. Wow Caroline I love your cottage. The exterior is amazing. Wonderful details inside. I love the pretty kitchen it is so inviting. Its an adorable cottage. 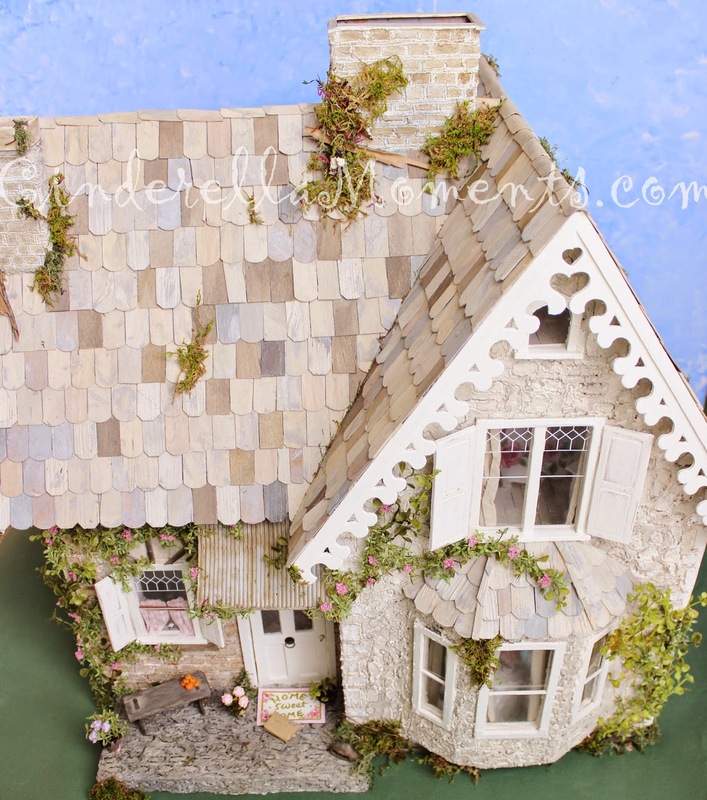 A fascinating little build, Caroline! I could not get enough of looking at everything. I was looking at your Etsy shop because I wanted to get a book but it seems you only sell PDFs. I'm so disappointed because I prefer books. It's so much easier to build something when we have a book in front of us than to keep staring at a computer screen. You know how I'm always fascinated by your cottages, but this one is really special. It is really awesome and makes me dream. Oh my goodness I'm in awe of your incredible talent. Your houses are amazing. 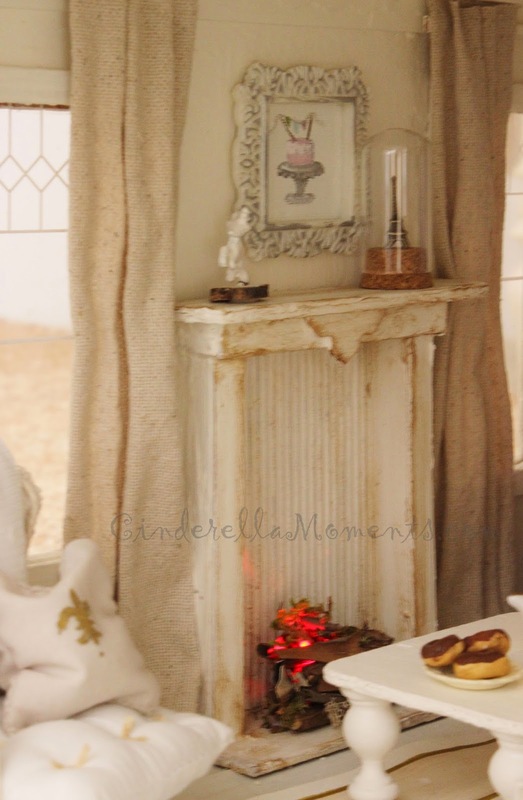 This one is so gorgeous and I love love the little mouse! Happy to have came across your blog! 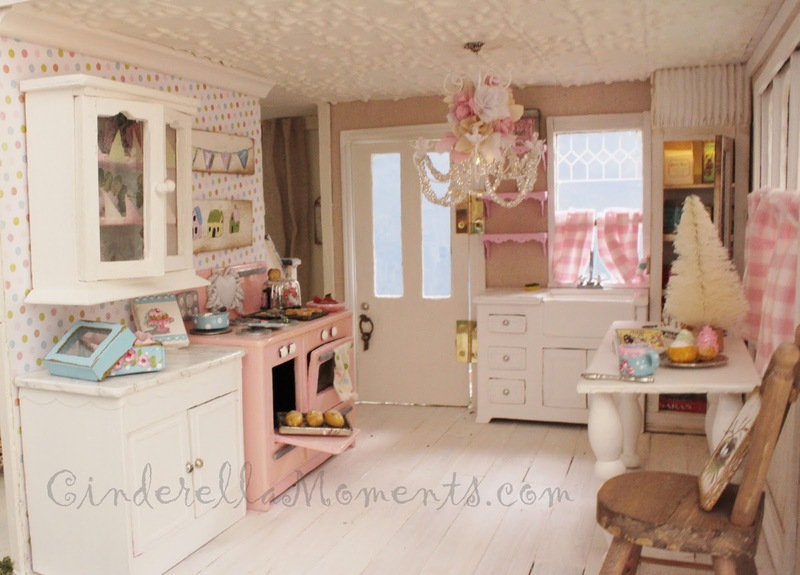 Caroline, this cottage is adorable! I love all your little touches. Your artwork adds a special touch. I especially like your signature piece on the purchased chair, the little birds nest. The cupcake is super cute too. Great job! Lovely house!! 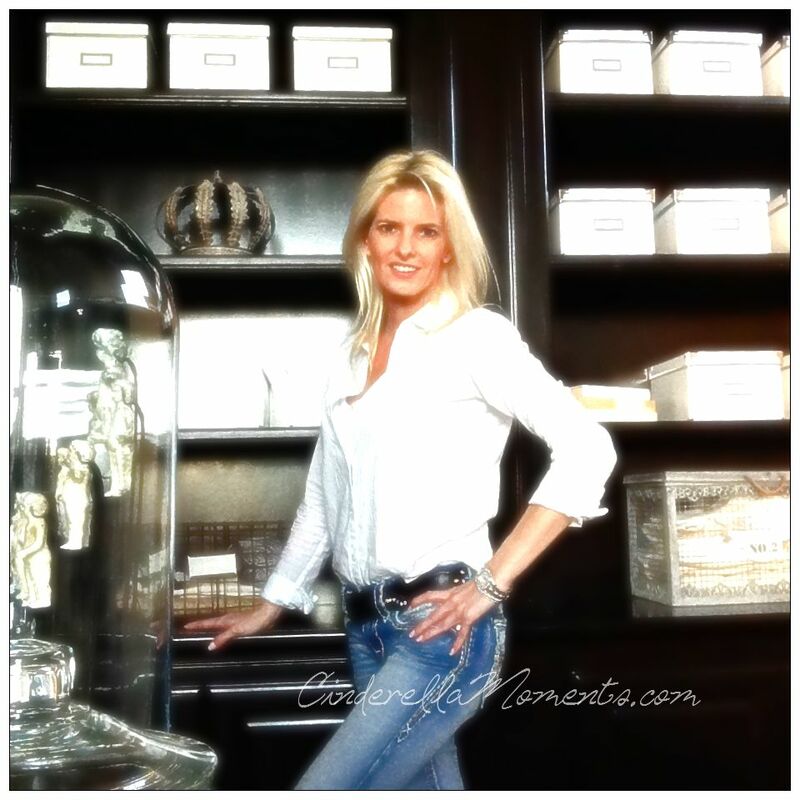 Love the closet and the pantry! 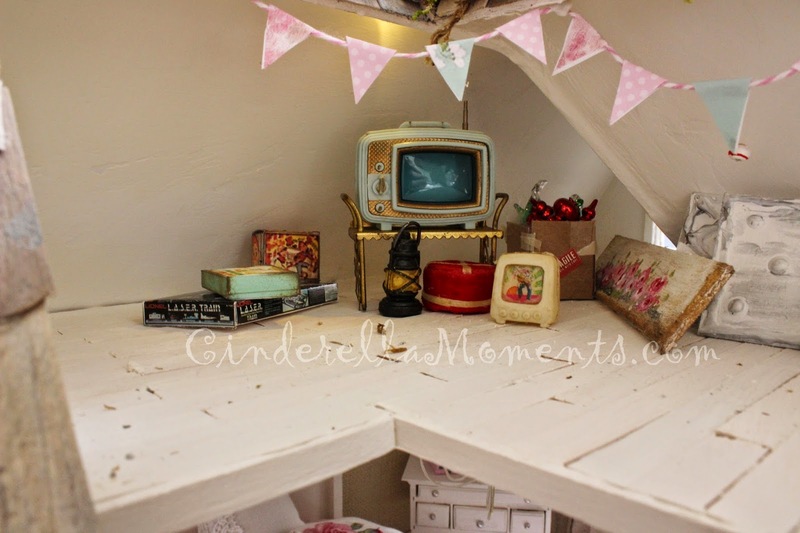 The kitchen is just wonderful and the attic is perfect with all the small details! Me encanta el estilo inglés de los cottage y más si eres tu quién los hace ya que les das ese punto mágico tan personal con tu modo elegante y nostálgico en la decoración,me gusta tanto por fuera como por dentro y esas flores en la fachada....son perfectas!!!! WOW!! I want to move in! Can I shrink myself and move in?!? This is stunning. One day I am going to own one of your creations. 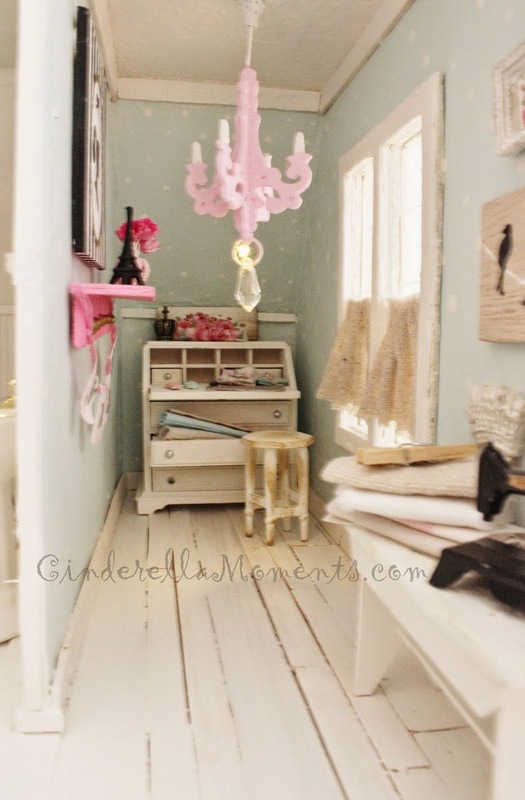 Your Doll house is amazing! I love it so much! 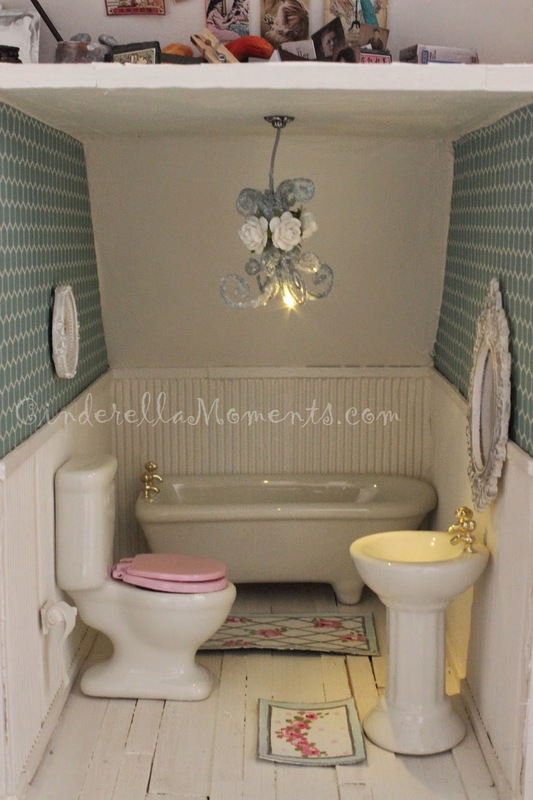 What a charming dollhouse! First off, the muted color scheme is gorgeous. There are so many things that I love about this house! 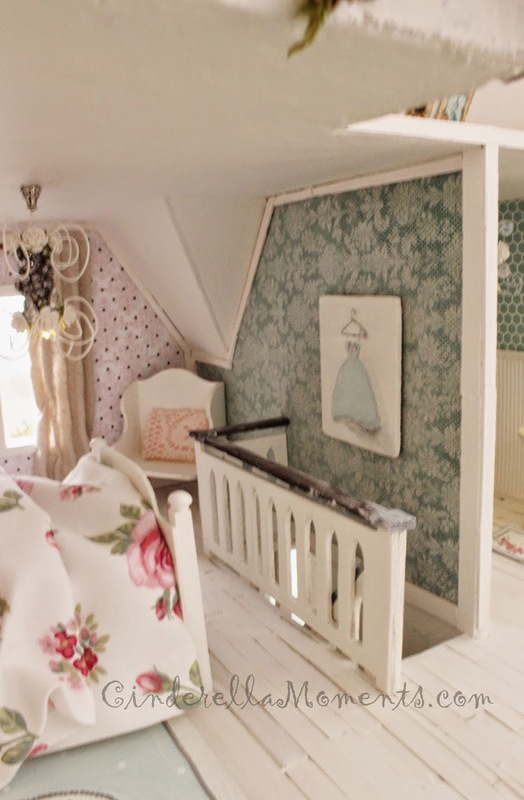 The front door, the little closet under the stairs, the glitter houses, the pantry, the pink chandelier in the studio, the bold rose print on the bed. Everything is just so beautiful! :) Great work once again, Caroline! I'm in love! I'm such a sucker for English architecture. You inspire me in so many ways. I might borrow that look for a half scale house I have. With all the white and natural colors it will look nice with my pottery barn paint colors. Ps. I thought Wiltshire cottage was for you? Love the style and detail. Beautifully done..